Forking can be very beneficial for both you and your pig. At times of stress or just for relaxation, it can help take the edge off so to speak. "Forking", as it is known in the pig world, is simply taking a sharp (not dangerous of course) object and simply poking or scratching your pig with the item. "FORKS" are great examples of one of the items used (hence forking). The item is placed most commonly midline on either side of the pig and moved around as if you are poking/scratching the pig. Some pigs are more sensitive to forking than others, however, often times you will get a wonderful reaction like you see in the video here..
Forking can be used to help aid during hoof trimming, vet visits, general skin and body care, routine checks, and flat out pleasure! You will sometimes notice the pigs mohawk sticking up during the time of forking. There are some pigs whose mohawk raises when there is a fork or back scratcher sighting, because they know what is coming, The best way to explain this behavior is relate it to when someone touches you in a good way that sends goosebumps all over your body. This simple touch to pigs results in a trance like state. Most pigs LOVE it, but there are the occasional few that do not care for it. To see if this is something your pig would enjoy, just try it. "Forking" your pig will not harm your animal, you do not scratch so hard that you pierce the skin, you only use the edges of the fork or back scratcher to graze the surface in order to elicit a pleasurable reaction. You can use your fingers to mimic the same thing, but there is something about a fork that really touches on the nerve endings under the thick skin of a pig. Have fun forking your pig today. If you should get a response like your pig acts as if he/she can't move, or falls right over....you are doing it right. Feel free to send us your forking videos either on our Facebook page or email us at minipiginfo@gmail.com. 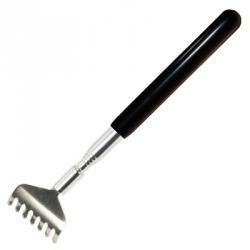 Back scratcher, can be found at most stores that sell health and beauty items. Telescopic fork from Spencer's gifts. "Claw" back scratcher. Can be found at most Dollar stores for 1.00. Wood back scratcher. Found at most stores that sell health and beauty items. Check out this awesome new video of Miss Willow owned by Alana Rogers. Willow loves to be forked so much that no forking is even involved!!!! Stay tuned for further forking news!